Many pet enthusiasts are now keeping fish in their homes using small tanks that can fit in small spaces around the house. To care for the fish and keep it healthy, your responsibilities will include feeding it and cleaning up the mess left behind. Messes might include excess food, algae growth, and dirt or other debris getting into the fish tank. 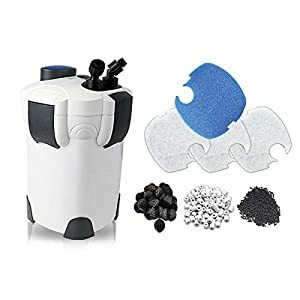 In order to clean and purify the fish tank properly, you will need the best fish tank filter available on the market today. Choosing the right type of fish tank filter can be difficult because there are so many options available. However, not all of them can do the job perfectly so it comes down to having the right information. Before you can choose a filter system, it is important to understand how it works and its capabilities. Luckily, here you will learn all you need to know about the different functions of fish tank filters, the types, benefits, and top models available. Before you can learn more about which fish tank filter to buy, it is always better to start from the basics, so we will first discuss the different functions of a fish tank filter. The functions are categorized into three major classifications to help you choose the right one. Fish produce ammonia from their gills as they breathe, and also as part of the waste released from their bodies. The ammonia needs to be removed from the tank frequently, as it is quite toxic to the fish. The use of a filtration system will help in the elimination of the fishes’ bodily wastes from the tank. Sometimes you might find the fish dying from the ammonia accumulation, but this is something that can be easily avoided. It is common to have debris in a fish tank, due to excess food fed to the fish and other dust particles from the room. The mechanical process of a fish tank filter is meant to remove this debris and any other visible waste from the tank. Once the water is purified, the tank will contain the clean, clear water both you and your fish prefer. Having a clean and well-aerated tank will promote good health for your fish. The water that we rely on for drinking and cooking comes from different sources. Some sources might contain hard metals or other materials which might be harmful to the fish. This creates the need for a filter that can remove such materials from the water. Different types of filters will have different methods for cleaning up the impurities. Once they are removed, the fish will be surrounded by clean water in which they will be able to thrive. When shopping for fish tank filters, you can expect to see many different models on the market. These filters are all from different manufacturers, which makes it hard to figure out which is the best filter to choose. Starting today, however, that should no longer be a problem, as you can simply reference the products included below, a list of the best filters on the market. In the end, you should be able to easily pick the right filter to handle your aquarium needs. This filter works with both freshwater and saltwater fish tanks. This broad range of application is the reason that so many people love and are loyal to this product. 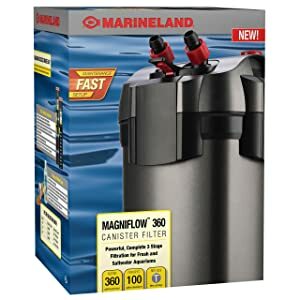 This canister filter can handle different types of aquariums, in sizes up to 200 gallons. The product can provide an impressive 350-gph water flow when in use. Just make sure you keep it well maintained, so as to keep it working efficiently and effectively. The product starts up easily, with the simple press of a button, and it has a 360-degree rotation for better filtration of the tank. Having a large filter tank means that you can use the system for a long time before replacements are required. The filter makes a lot of chattering and grinding sounds when in use. This is something that the manufacturer needs to work on improving. In the meantime, some users may be bothered by the noise. This filter model provides superior filtering capability. It is ideal for all sizes of aquariums made by different manufacturers, and will work for either freshwater or saltwater aquariums. The powerful motor technology helps to speed the filtration process. These varying functionalities make this product far better than its competitors. You simply need to follow the straightforward setup instructions to get the product working as required. For those who are worried about noise, this product works quietly, with fewer vibrations than other filters. The multi-stage filtration process promises to offer a high level of quality and efficiency for the product cost. The canister lids design is something you will always like as it comes with a feature that gives the filter a water tight seal. It is always important to keep leaks from happening especially when it comes to the filtering of the water. No wants to end up with leaks coming from the filter as it means you would be losing substantial water that should be circulated back to the aquarium. There is also the use of the polishing filter pad incorporated in the filter. The work of this pad is to remove the fine debris that might affect the quality of the filtered water. You should now end up with cleaned water that can be used by the fish without any problems. The model is still designed to have the bio-filter balls and ceramic rings. They are important for providing a multifaceted surface area important for growing the bio spires. This means that your aquarium gets to have all the important filtration and replenishment of the bio spires. You still get the black diamond carbon important for removing the odors, discoloration and other water impurities. This is in aim to make sure that you get clean water being pumped back into the aquarium. The product has a permo-elastic silicon sealing ring that keeps the product securely sealed while working in the aquarium. 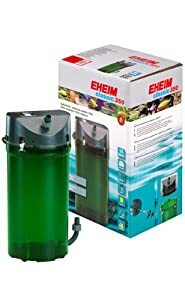 You no longer have to worry much about experiencing the leakage that has been reported as occurring with other models of fish tank filters. This filter is equipped with filter sponges and other types of loose filter media, making it easy to increase the working capability of the product. There are several accessories included with the device, such as a spray bar, hose, inlet hose, and many others. 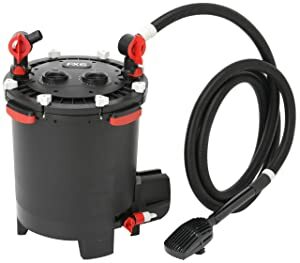 This is a heavy-duty fish tank filter that is sure to provide excellent quality and durability in exchange for the cost. 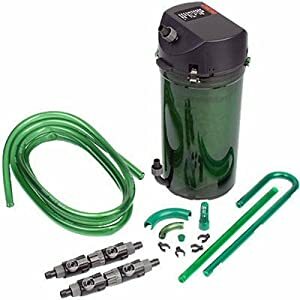 This product can pump 265 gallons per hour and is mostly used for 100-gallon aquariums. It is designed to deliver powerful performance, even when used continuously for a long time. Using this filter system you can expect the delivery of crystal-clear water to both marine and freshwater aquariums. The product comes with a coarse sponge that will effectively remove the waste and excess food in the fish tank. If you check out several models that are being used as fish tank filters, then you are likely to get a model such as AquaClear Power Filter. The reason is that the company has been making the best filters over the years making sure that you get the right models at all times. This model is one of the best hang on back filters you can buy today for your aquarium today. It is designed to be versatile so that it can end up meeting the needs of most aquarium hobbyists. The manufacturer offers the model with different variations in terms of flow rates. This means that you should get to pick one that can deliver on the flow rate you feel is appropriate for your needs. Its unique design is going to give you an impressive filtration capacity. This is better as compared to the other models in the same category. The model employs the use of the flow control technique important to help in reducing the effect of water flowing. This is great for making sure that the impellers are not harmed. Its design also works great for the multistage filtration process. This ensures that the beneficial bacteria needed in the aquarium are not affected due to depletion. The filtration system is made to start automatically once the canister fills with water. No siphoning of the water is necessary in order to get the product started. This model has a purge valve drain at its base. The valve’s purpose is to help to empty the canister so that maintenance can be easily performed. The spout attached to the system can be adjusted to send multiple streams of filtered water to different corners of the aquarium. The intake of the canister is wide and round-mouthed, and such a feature helps with faster action to siphon more water into the canister more quickly. The product comes from a company known for making the best aquarium filters. First of all, it is the pump unit, which has been seen to be a highly reliable module that requires minimum service. If you are looking for a model that doesn’t require a lot of attention, this is one you can purchase with peace of mind, knowing it will do its job reliably for you. This model has all the qualities a person would want from their aquarium filter: better technology, improved performance, and a high level of efficiency. The use of a one-chamber design makes it easy for the user to install the different types of filters with ease. You simply and easily swap them out for newer filters when it’s time to change them. For optimum operation, the manufacturer recommends you give your filter a maintenance overhaul after three to six months. This is going to be quite useful for most people looking to filter the large sized aquariums. The model is designed to work with various aquariums up to 150 gallons of water capacity with ease. The model will easily deliver a great job important for making sure that the large supply of water is maintained clean at all times. Having an overall capability of 525 GPH, you should find this model being faster than most models you know. The water filtration of this model should easily live up to the standards of most people. It comes with a three stage filtration process important for increasing the chances of cleaning the water effectively. These stages include mechanical, chemical, and the biological filtration. As part of making sure you get to enjoy using the model, there is the 9W UV sterilizer that comes with this model. This should help further with filtering the water by killing the harmful algae and bacteria that might be in the water. The low noise operation is something you can always look forward to when buying this model. Many people would feel comfortable having such a model in the room they are relaxing in and still clean the water in the aquarium. Being easy to use further makes it common among many people looking for a great filter for their aquarium. There is no doubt that the filtration rate of 525 gallons per hour is going to be something that you like about the filter. Many people would find it useful as it gives them the power to deliver on better performance at all times. It should be able to clear the dirty water from the aquarium in less time as compared to some other models. It is still great for the large aquariums up to the size of 200 gallons. The five stages of filtration are important to make sure that you get to remove more dirt and other types of impurities from the water. The five stages should give you more confidence about the type of model you are getting for yourself. It also features a 9 W sterilizer important for killing the algae in the water. The model on overall is designed to be easy to setup and install. It comes as a complete kit with all the things you will need to make sure that it is working properly. You will not have to buy anything extra when you have such a model. It is still possible to adjust it to fit the larger tanks thanks to the mounting options. Here are the different types of fish tank filters you can expect to find on the market. These filters are small, making them great for compact aquariums kept in a hospital or home. Their size makes them suitable for easy integration with a wide variety of fish tanks. Even though they are small, they can still be very sturdy and well constructed. It will help to keep your small aquarium inhabitants healthy and free from any harm in the water. Although the filters are designed primarily for biological filtration, some models also have replaceable cartridges. These cartridges have activated carbon to help with chemical filtration. Power filters are a type that is widely used in many aquariums. They are relatively easy to set up and last for a long time. Many people love them, as they provide the best performance for biological, mechanical, and chemical filtration. They are designed to easily hang on back of the aquarium for convenience, and can be used for many different types of fish tanks. The replaceable filter cartridges make maintenance very easy, as compared to other types. 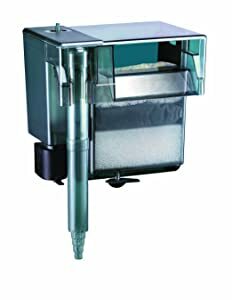 The canister filters offer all the functions you need in a fish tank filter. You can expect them to deliver on all fronts—mechanical, chemical, and biological functions. The body, which is often called the canister, is significantly larger for these filters than it is for other types of filters. Each canister will have locations to hold each different type of filter media, and the large canisters will have more filter media. This type of filter does take more effort to set up and maintain, in exchange for its power and flexibility. These are known to be the best in biological filtration. They are designed to be a great fit for saltwater aquariums that demand effective biological filtration. These filters get the name “wet/dry” because the filter media can be exposed to both air and water. This type of filter, in general, will help to increase the beneficial bacteria that lead to effective processing of waste materials. With the following considerations, you should be able to make the right decision and buy the correct quiet fish tank filter for your aquarium. Not all filter systems will work with all the tanks. Some have the capability to handle more than one tank size, but others will be fixed. The manufacturer will always indicate the recommended tank size in the description. Once you have the right fish tank size in mind, it should be easy to make a decision on the filter system to buy. The filtration technology will differ from one brand or model to another. Each company always wants to be rated as the best, depending on the filtration technology. This will prompt some companies to come up with a number of “best features” they could use for filtering the water, and some methods might not be suitable for all types of fish tanks. Take the time to learn about the different filtration systems and see what works for your current fish tank. The water flow rate is measured in gallons per hour. You want a filter that will fill your fish tank faster. Research to find this rating before making the purchase. It is better if you can compare different brands to see which offers the best water flow rate. Some brands will have a higher flow rate than others do, so always choose wisely among competitive brands. Brands matter a lot when choosing the right fish tank filter for your aquarium. Some brands, like the ones mentioned above, are known to offer more sustainability than the others. Using products from a brand should be a sure way of knowing that other products of the same brand will work effectively. Such top brands include companies such as Fluval, Penn Pax, and many others. Sometimes it is easy to find the top-rated brands by sorting the products by rating. This will give you the best products that are seen to deliver according to user needs. Any filter review will help to identify a good fish tank filter that you need for your aquarium. Some filter manufacturers might exaggerate the filter features that do not end up meeting the user needs. From the reviews, you can know more about the filter and decide whether it works for you or not. Some of the users of such filters will offer the useful information of helping other users to identify the best filters in the market. Make sure that you read the reviews from top rated stores and review sites as a way of finding honest reviews about the products. As you can see, several things actually affect how the filter will work. There are new models coming to the market each other day, so make sure that you can choose the right type that works for your pet care model. The design is quite important, as it will determine if the product can fit in your aquarium or it can be adjusted for a perfect fit. Set up and installation process is sometimes a deciding factor. Sometimes it is hard for new users to operate the filters even with manuals supplied by manufacturers. If the product is designed to easily fit on the fish tanks, it should be easy to set up and install. Now that you know more about the best fish tank filter systems, you can choose the correct one easily. Thanks for sharing this information on the pros and cons of the filters. So many times I have looked for cons of some of these filters and found nothing useful. I am looking for a two gallons filtered fish tank for a beta fish , which is the best and were can I buy it? 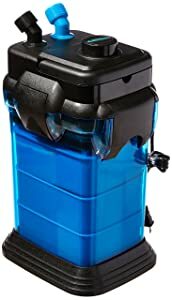 I recommend the Tetra Cube 3 Gallon, which I’ve had a good experience with. It has a sleek design, very nice light, and a filter included. The filter can be a bit noisy if the part that connects the airline tubing on the filter to the power plug rests against a surface, though. You can buy this tank on Amazon.com. If still in doubt, look up “best 2 gallon tank for betta” or browse through 2 gallon tanks on online shopping/fish store websites. My aquarium. Is 5 feet tall. 20 wide. 30 gallon. No matter what filter. I purchase my bubble wand ect. At the bottom stops working. What type of pump do i need. Review sites like this can be very useful for new aquarium keepers. Most important is to understand that “good” things are visible in the water (food particles, etc), and the “bad” things are invisible (ammonia, nitrite, etc). Biggest mistake of new fish keepers is to make the water look “clear”, but to not remove the invisible things which kill the fish. 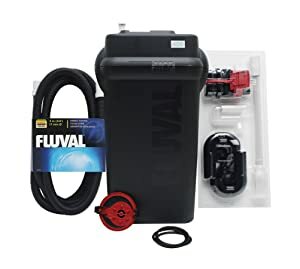 I have a 150 gallon tank, currently using 2 hang on filters, as a senior citizen I am now having a difficult time when removing some of the water for cleaning the tank, plus the 2 filters seem to take longer in clearing the fresh water. Both filters are old and need to be replaced, what would you suggest as a replacement. Thanks. Hello. I have a 30 gallon tank I clean religiously every Monday to keep optimal and healthy happy fish. Freshwater with a couple mollies “Pearl, Spot and Elvis”, 2 guppies “Nemo and Dory”, an albino Plecko “Dart”, a bristlenoe Plecko “Dino” (very lazy and doesn’t do anything for my tank hence the albino plecko lol), and a community Betta “Cinderella” (yes that’s right a Betta in with my other community fish). She loves to play in the water flow from the side hanging filter BUT I can’t stand the noise it makes constantly like a waterfall. I was hoping for something a bit quieter but not to much it would hurt Cinderella’s scales. Also the bettas eat so slow with side hanging filtration I have to turn it off at every feeding to allow her time to eat otherwise as slow as she eats all her food just gets pulled away and she goes hungry and I need something I can trust to not harm her AND allow her food to rest at the top to eat comfortably. Also I’m on disability so the more affordable on upkeep such as replacement filters I NEED to keep in mind because this side hanger the filters are getting expensive. I need to change them every other week because they have become so cheaply made that cleaning them just doesn’t get the job done but once MAYBE twice now. Thanks in advance. Why does the filter flow attack the fish so that they get stuck in the outflow area? It should say “attract” the fish. Sorry.